Transparency Market Research (TMR) has published a new report titled, “Thalassemia Treatment Market - Global Industry Analysis, Size, Share, Growth, Trends, and Forecast, 2018–2026”. According to the report, the global thalassemia treatment market was valued at US$ 842.0 Mn in 2017 and is projected to expand at a CAGR of 7.9% from 2018 to 2026. Increase in R&D investment by key players for developing new drugs for treating thalassemia and rise in demand for chelating therapy are anticipated to fuel the growth of the global market from 2018 to 2026. Asia Pacific and Middle East & Africa are expected to dominate the global market owing to increase in prevalence of thalassemia disorder and high adoption of chelation therapy & blood transfusion for treatment by doctors as well as patients. The market in Asia Pacific is projected to expand at the fastest CAGR during the forecast period. Growth of the market in the region is attributed to large base of private clinics and hospitals, rise in number of thalassemia population requiring chelation therapy services after spleen surgery, and surge in adoption of blood transfusion among patients. The thalassemia treatment market in Latin America is likely to expand at a moderate growth rate during the forecast period. The global thalassemia treatment market is projected to be driven by value added features offered by various thalassemia drug manufacturing companies in order to streamline the day to day work flow and increase revenue. The thalassemia treatment provides limited range of features and benefits ranging from patient pain heeling remedies to treatment procedures. For instance, very less number of people go for the much beneficial chelation therapy. These features help physicians and nurses to streamline the chelation therapy required for patients to maintain their daily workflow efficiently and effectively. Key players offering thalassemia treatment are coming up with value added features such as bone marrow transplantation, stem cell regeneration, gene editing methodologies, and effective modality features used for drug manufacturing along with creating a prominent candidate molecule for drugs. These features can reduce the overall operating cost and improve the overall effectiveness and efficiency of treatment practices. Companies are focusing on the development of combined drug therapy in their system to effectively integrate chelating therapy or other treatment procedure at an affordable cost. These value added features save time for physicians and help improve thalassemia patient survival performance. Traditionally, blood transfusion based on type of thalassemia treatment was the most commonly used procedure among thalassemia patients. This treatment type was associated with availability of donor and cost of treatment procedure. Moreover, chelation therapy based on thalassemia treatment are priced on perpetual license model and are expensive. Chelation therapy treatment enables patients to practice intensive therapy to treat acute iron overload leading to 90% recovery among thalassemia patients. These chelation therapy based treatments address specific challenges faced during the treatment procedure. The chelation therapy treatment facilitates benefits such as pain relief, and increase in motion of blood flow among patients. North America and Europe accounted for major share of the global thalassemia treatment market in 2017 and are likely to gain market shares by 2026. High rate of immigration from tropical regions, increasing health care budgets by governments, and government initiatives to promote thalassemia treatment technique contributed to the leading share of these regions. Asia Pacific is projected to be the most attractive market for thalassemia treatment, with highest attractiveness index. The market in Asia Pacific is expected to expand at a high CAGR of 9% during the forecast period due to large number of thalassemia patients opting for chelation therapy in developing countries such as India and China. Well-established health care facilities, medical tourism for treatment of thalassemia, and high adoption of blood transfusion safety technique in countries such as Turkey and GCC Countries are likely to drive the market in Middle East & Africa. The market in Latin America is poised to expand at a moderate growth rate during the forecast period. The report also provides profiles of leading players operating in the global thalassemia treatment market. bluebird bio, Inc., Acceleron Pharma, Inc., Novartis AG, Celgene Corporation, and Shire plc (Takeda Pharmaceuticals) are the leading players operating in the global market. 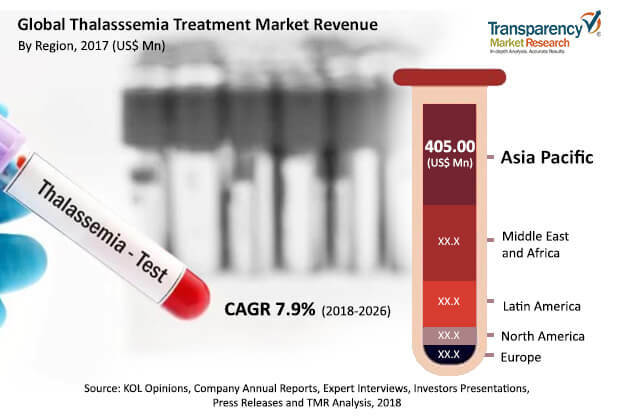 Companies operating in the thalassemia treatment market aim to increase geographic presence and research & development through strategic acquisitions and collaborations with leading players in respective domains and region. In December 2017, Shire plc committed to pay approximately US$ 1,409.9 Mn to contract vendors for administering and executing clinical trials. Other prominent players operating in the global thalassemia treatment include Incyte Corporation, Kiadis Pharma, Gamida Cell, Celgene Corporation, and Bellicum Pharmaceuticals.